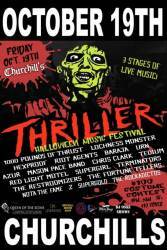 Thriller Music Festival with 1000 Pounds of Thrust, Lochness Monster, Hexproof, Riot Agents, Baraja, Urn, Azur, Mason Pace Band, Chris Clark, Tedium, Red Light Motel, Supergirl, Terminators, The Restroomizers, The Fortune Tellers, Nota The Fame, Z, Supergold, The Rockadictos, and more! Plus a $100 costume contest! 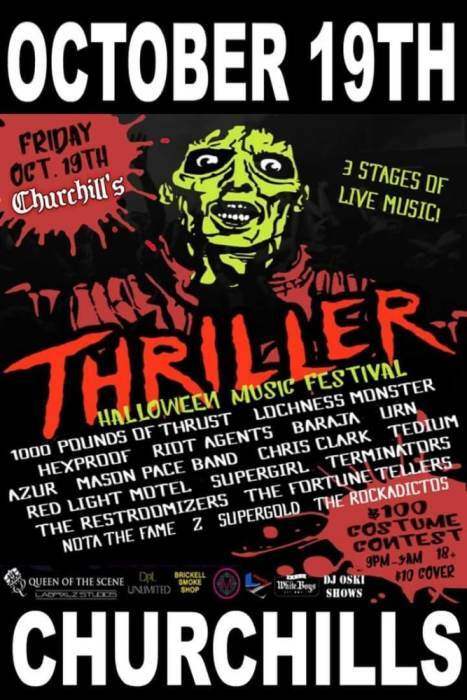 The 12th Annual Thriller Halloween Music Festival at Churchill's Pub Friday October 19th, 2018 from 8pm til 3am with 3 stages of live music of all styles, a $100 Halloween Costume Contest at midnight, Arts & Crafts, Vendors, Free Zombie makeup and costumes, Thriller Zombie Flash Mob and more... 18 & up w/id. Tickets are two for one in advance and $10 at the door. Support the locals go global.